Branching out the scope of Piehunter pie reviews today, after a trip to see Arsenal play at the Emirates Stadium this afternoon. On a cold December afternoon, nothing works better than a nice hot pie at half time. As you can see from the picture, I’m showing my age by matching my pie with a cup of tea rather than a pint… but hey ho. 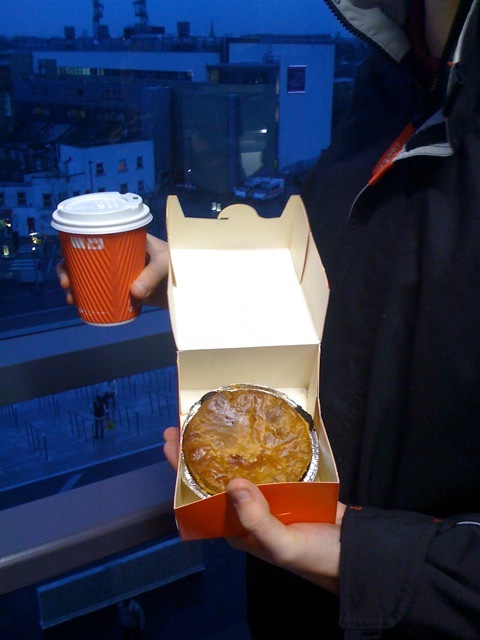 The pie was a chicken balti affair, wrapped in puff pastry (a bit too well done) and served in an Arsenal branded box. The pie was actually not bad at all, with plenty of chicken and a tasty, slightly spicy balti sauce. The pastry was a bit on the overcooked side, but this did not ruin the experience. The cup of tea was fantastic and kept my hands warm well into the second half. Ale: n/a although 7/10 for the cuppa! Previous Un Pithivier Monsieur? Oui Oui Oui….